Selfie of me on the way to the trail head. It is hard to pick a favorite thing. I have so many things I love to do. But I’ve went and picked one for you all. I never really liked camping all that much when I was a kid. We didn’t do it often, and when we did, we usually went to full campsites, where, if we leaned too far out of the tent, we may fall into the neighbor’s campsite. I never liked all the people. This summer, we went camping twice with our friends. The first place we went to was Lake Ellen, a tiny campground (it had like space for 10 campers) that wasn’t full at all. We had a lot of fun. So we decided to go again. 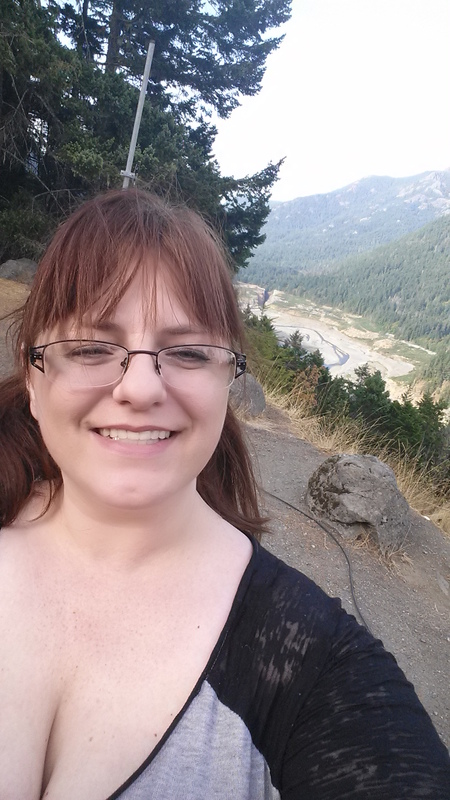 We went to the Olympic National Forest, near the Elwha River. It was very green there. Near the camping area (which had more people in it, it had 30 spaces and a lot of them had campers in them), there was a hiking path to the hot springs in the area. On Friday, we drove up to the trail head. The picture you see below is the road up to the trail head. We hiked 2.5 miles to the hot springs. I had to climb up a dangerous cliff to get there, and spend my time in the hot spring in a constant state of agony because I knew I’d have to go back down. It was nice though. We packed a lunch and had it while we soaked. At some point, I got out to cool down and was leaning across a log. Jen had also gotten out and was to the left of me. Dee and Paul were still laying in the pool, which wasn’t deep, so you could lay or sit and it would be up to your chest. Our backs were to the trail behind us, and we faced the cliff, where we could see the water trickling in through the rocks, and a very little bit trickling out of a pipe above the crevice. Paul grabbed handfuls of pebbles and started clinking and clicking them against the cliff in the vain hope that one would make it into that enticing pipe. Over and over he threw, trying with all his might to get just one pebble into the hole. Over and over we listened to the doomed pebbles as they careened down the hill or plinked into the water. I got annoyed. Paul annoyed me. It happens a lot. So I un-leaned from the log and bent over to pick up three rocks. They were small little things, not anything to write home about. Paul made a harumphing noise when I stood up and put his pebbles down. I threw the first one, it flew a bit too far to the left of the pipe, but it was closer than most of his had been. Heartened, I threw the second. It pinged off the outer edge of the pipe. I started to take notice of what was happening–things were getting real. I threw the third. We watched as it flew in a perfect arc, as though geometry and gravity and the universe had all come together for this one blessed moment, straight and true the stone flew into the pipe. It ringed the inside, and we all sat in stunned silence listening to the sounds of earth and metal as hot spring water gentle dripped into the pool. It was kismet. It was fate. Call it what you will, but I call it the divine hand of the world proudly proclaiming my victory over Paul. Paul hates to be showed up. I always show him up. Well, almost always. Soon after, we packed up and descended the mountain. It was growing dark, and we’d only brought one flashlight. I braved the trail and made my way down off of the heights that had so daunted me, by the simple means of sitting on my heels and slip-sliding down the little streamlet onto the trail. My sweater came out smelling and my bottom was wet, but I had no broken bones or bruises. That’s good enough for me. The walk home wasn’t all that exciting, but we did see a lot of large groups going up to the hot springs. Make of that what you will. We made it back to the campsite, ate dinner, and ran into the tent immediately as the rain started to fall in earnest. It had looked like rain all day, so we’d hoped it’d wait until later, but it didn’t. We all bundled ourselves in the tent, and laid there telling stories like teenage girls at a slumber party. It was great. Oh and my kids. I love them too. They’re good guys.